There are so many reasons to immerse yourself in fiery foliage, shrub-filtered air and breathtaking views. One of the greatest bringers of peace in life is mother nature, but there’s something particularly special about her mountainous terrain. International Mountain Day marks an awareness of the people who live in these mountains, and the role that these regions play in providing food, water, and recreation. Mountains and mountain-protected areas have been noted as places of spiritual solace since records began. They evoke inspiration, recreation, awe and relaxation. Walking, particularly in nature, is powerful. It strengthens are coping skills and releases stress. It’s been known to help treat depression and improves cognitive function. Hiking dramatically improves heart and lung performance, improving stamina and boosting metabolism. Both the act of walking and being in nature has been proven to lower blood pressure. Climbing uses muscle groups in the upper and lower body, helping to strengthen the core and reduce back strain and pain. Being in nature boosts serotonin levels (the feel good neurotransmitter), and increases activity in the parts of the brain responsible for empathy, emotional stability, and love (whereas urban environments do the same for fear and anxiety). Climbing a big ole mountain teaches you patience and perseverance. The classic quote that tells you “not to look at the whole mountain take it one piece at a time” is something you will come to understand. You will learn to never give up; to know that the reward will be worth the work it takes. 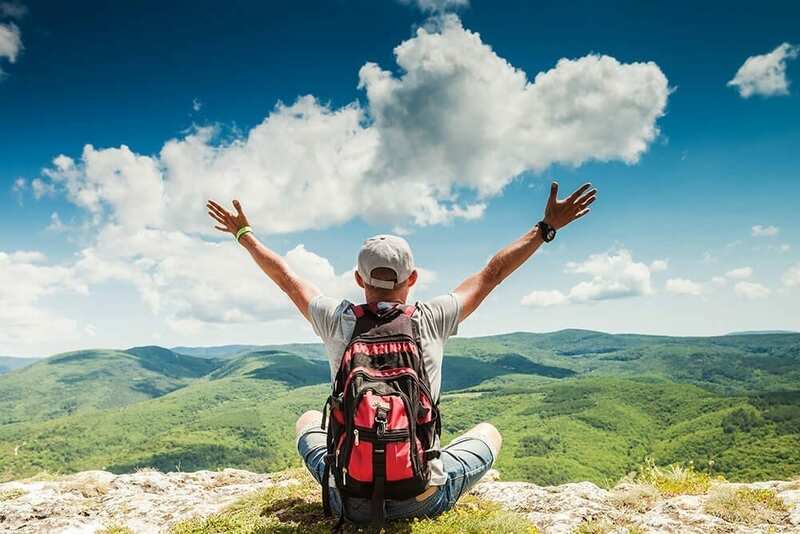 Hiking halfway up a mountain boosts your self esteem… Reaching the top and yelling “I’m the king of the world!” into the blissful wind is all the confidence you’ll ever need. Scents and smells have a powerful effect on our health and emotions. The aroma of pine, fir, cedar and cypress trees contain phytoncides such as alpha-pinene and beta-pinene which make up the essential oils of many plants and trees. These have been proven to decrease levels of the cortisol stress hormone. 451 years ago, Shakespeare was well aware of the benefits of walking for health. To still my beating mind.” – Prospero, The Tempest. It’s becoming increasingly rare to find places that don’t carry the sound of modernisation; industrial, electrical, loud, constant. We may not even realise it, but our senses can easily become overloaded, leading to increased irritability, anxiety and fatigue. Nothing in this world is quite as healing as the stillness and calm of an empty, tree encompassed trail. See our recent post on how Silence is the new trending wellness luxury. When you pack for your day out in the rockies, you intentionality bring in the food and drink which will help your body. A healthy breakfast, fruits, nuts, lots of water and hearty sandwiches. It’s almost instinctive to choose healthy fuel so that your body will function properly during the climb. There’s something that just doesn’t feel right about eating artificial foods while being present in the natural world. Master your thoughts and help others to do the same! Here at The School of Natural Health Sciences, we offer a diploma correspondence course in Mindfulness, Meditation, CBT, Neuro-Linguistics Programming, Stress Management and Professional Relaxation Therapy. These are fundamental qualifications for understanding and identifying thought patterns, and knowing what to do to change them. We’re honoured to have trained over 40,000 therapists over the last 20 years, with our wide range of holistic therapy distance learning courses that allow the student to create their own world of study.